A visit to the island of Capri is one of the most popular day trips for visitors to the southern Italian region of Campania. Just a short boat ride from Naples, Sorrento, Salerno or travel destinations on the Amalfi Coast, the beauty of Capri will draw you back again and again. Although located just beyond the tip of the Sorrento Peninsula, the island of Capri feels worlds away from the Italian mainland nearby. Perhaps it’s the small size of the island that makes the natural beauty of Capri all the more intense. The cliffs are steeper, dropping down to blue sea that reflects the sun in vibrant shades of blue. Trees, plants and wildflowers cling to the rocky cliff sides, and goats pick their way carefully along the mountains, knowing that any misstep will send them plunging down to the blue sea far below. The beauty of Capri is all consuming. It’s rare to find a place where the views are so exquisite in every direction. One of the best spots for experiencing the awe-inspiring feeling of Capri is from the top of Monte Solaro, the island’s highest point. While you can climb a winding and steep 2km pathway, the easiest and most scenic way is to hop on the Seggiovia Monte Solaro, or chairlift, that goes to the top. 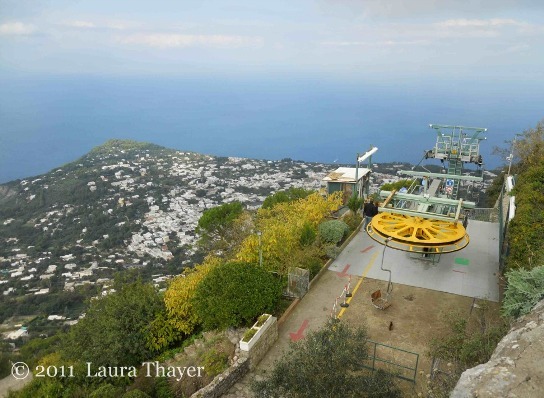 Located just steps from Anacapri’s central Piazza della Vittoria, the Seggiovia runs 156 individual seat chairs up the steep mountainside to a scenic overlook at the top. 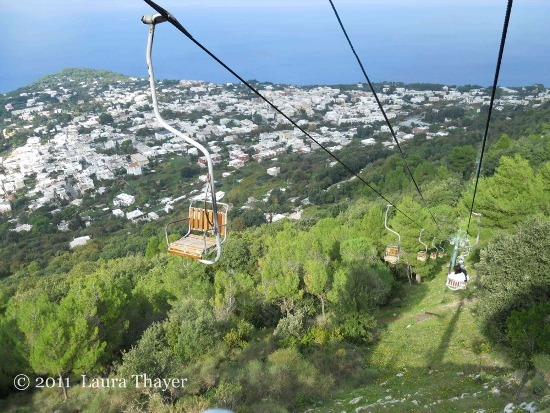 The ride is about 12 minutes and takes you first over terraced gardens as you slowly rise up above Anacapri. Soon the landscape turns rugged and wild as your chair floats up the side of the mountain. 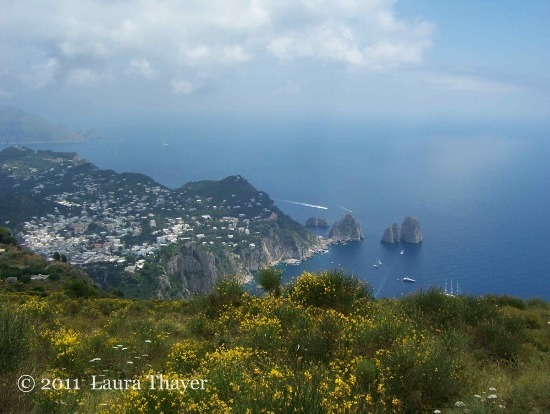 Look back and you’ll see the white houses, buildings and churches of Anacapri with the bright blue sea of the Bay of Naples just beyond. On a clear day you can even spot the island of Ischia across the bay. The only sound is the hum of the chair lift and perhaps the wind blowing through the pine trees. It’s a peaceful moment to prepare for the views you’ll find at the top. The workers at the chairlift, and perhaps a friendly cat, will help you off and greet you at the top. From there it’s just a short staircase up to the amazing 360 degree views. Look one way and you’ll spot the gentle curves of Mt. Vesuvius rising above Naples. Across the bay is the island of Ischia and to the right you’ll see the mountainous Sorrento Peninsula, home to the famous Amalfi Coast. Follow the pathway around the scenic overlook to see the views in every direction. 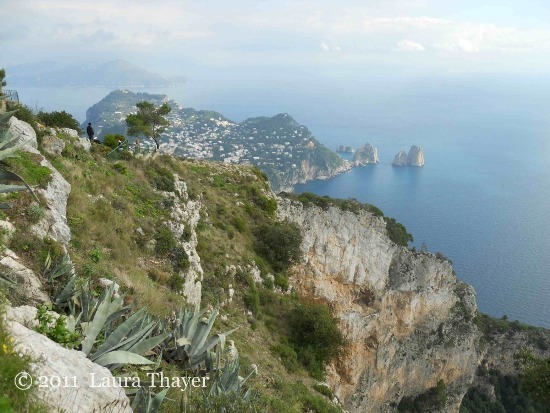 One of the most exquisite is the view overlooking Capri’s well-known landmark, the three Faraglioni rocks. Watch the tiny boats zip through the natural arch in one of the rocks and create a bright white path shooting out behind them in the deep blue water. Peer over the edge carefully to see the incredibly tempting sea, in shades from electric blue to turquoise. 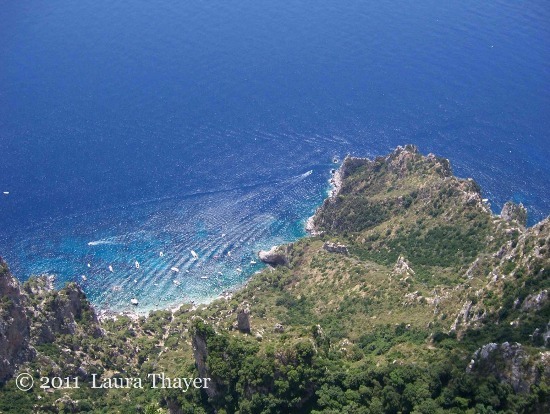 On a hot summer day, your next stop might be one of the beautiful beaches on Capri! The chairlift ride to the top of Monte Solaro costs €9.00 for the round trip. 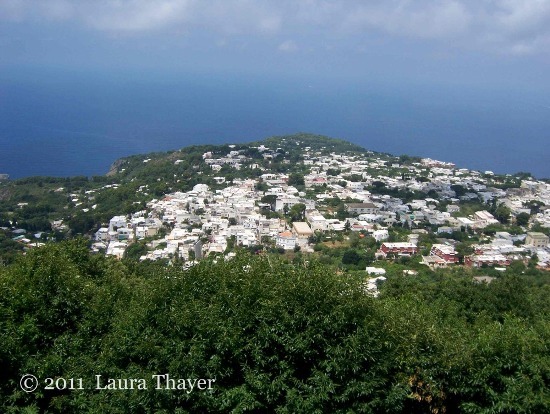 If you enjoy hiking, get a one way ticket (€7.00) and enjoy the much easier walk down from the panoramic terrace to Anacapri. Plan about an hour for the walk down, or even a bit longer for photo and picnic stops along the way.